Would you ride in a car with no driver? Google is trying to make a self-driving car. 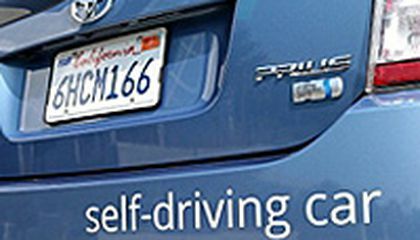 But despite progress over the past year, the cars have plenty of learning to do before 2017, when the tech giant hopes to get the technology to the public. Others believe it's more likely to take until 2025 to purchase one of the cars. Google's self-driving cars already can navigate freeways. Human drivers would be expected to take control if the computer fails. Eventually, Google says, there would be no need for a driver. Passengers could read, daydream, even sleep or work while the car drives. For now, Google is focused on the predictably common tasks of city driving. To deal with cyclists, engineers have taught the software to predict likely behavior. The software plots the car's path accordingly then reacts if something unexpected happens. While the car knows to stop, just when to start again is still a challenge, partly because the cars are programmed to drive defensively. At a four-way stop, Google's cars have been known to wait in place as other cars edge out into the intersection. The cars still need human help with other problems. Among them, understanding the gestures that drivers give one another to signal it's OK to merge or change lanes, turning right on red and driving in rain or fog (which requires more sophisticated sensors). Critical thinking challenge: Why are more sophisticated sensors required for understanding the gestures that drivers give one another to signal it's OK to merge or change lanes? The sensors are used to see if any person riding a bicycle in that lane or not. For example, if the self driving car is in the same lane as a bicycle rider, whenever the car get's too close to the cyclist, it will automatically change lanes do the cyclist won't get hurt. I think this a good idea because if they didn't put the sensors in the car, many people riding their bikes on the street could get seriously injured. It is also good that they made the car stop in red light and wait so people could cross the street. I think it is an excellent idea! I would love to go in a car with no driver. It would be so fun because then you can do other things like text while the car drives itself. A good addition that could be added to the car would be making it fly. i dont know if i would cause you dont know if the car has got in its liceins and mabey cause they cant put a car in the rode with no driver if it was dangeriss so mabey. no not really bc what if something goes wrong? yeah you would be dead so naaaaah i wont ride in a car w/o no driver! I think this is really great that there is a self driving car. Yes I would ride In a self driving car. I'm pretty the test of the self driving car will improve more . I would probably sit in the car and let it drive me around. I would be a little nervse because it's a robot controlling the car. I think it is very unique thing to have a robot controlling the car. I would not like to put my life in the hands of a machine, so no, I wouldn't really want to go in a car without a driver. I get scared before roller coasters for this reason.